Payments hubs can help banks streamline new payment offerings, enhance the client experience, and reduce operational redundancies. Boston, March 14, 2018 – With the emergence and practical adoption of new payment workstreams, it is time again for the topic of payments hubs to take center stage. 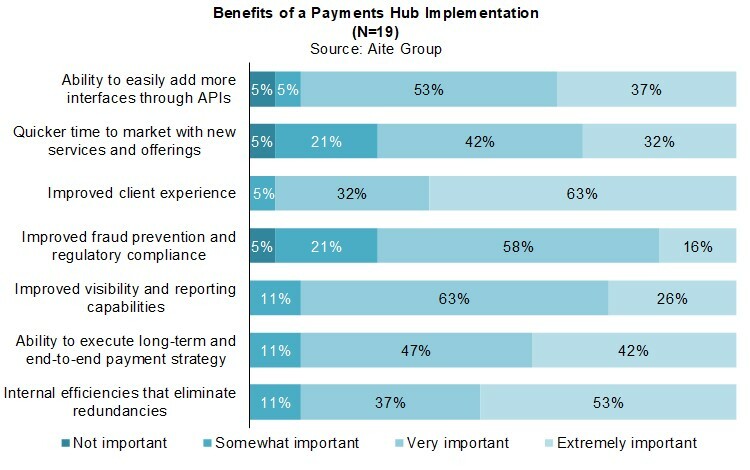 Adoption over the last decade has not quite met expectations, which is understandable given the expense, time, and resources that constitute a payments hub implementation project. However, now more than ever the need for banks to implement a solution is bubbling back to the surface. This note overviews payments hubs and helps financial institutions understand the value and key benefits of this technology as well as its current adoption. It is based primarily on the results of a December 2017 and January 2018 Aite Group online survey of executives from 19 of the top 60 U.S. banks. This 19-page Impact Note contains eight figures and three tables. Clients of Aite Group’s Wholesale Banking & Payments service can download this report, the corresponding charts, and the Executive Impact Deck. This report mentions ACI Worldwide, Bottomline Technologies, Finastra, FIS, Fiserv, IBM, Temenos, and Volante.